Earthed in Hope: Dying, Death and Funerals – A Pakeha Anglican Perspective. Review by Anne Priestley of Earthed in Hope. 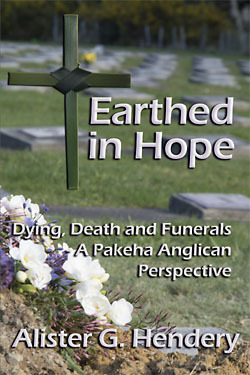 Earthed in Hope will enrich the funeral ministry both of those in the Anglican tradition and also those from other Churches. It is a valuable resource for funeral celebrants, counsellors and anyone supporting the bereaved and dying. Hendery reflects on and responds to spiritual, theological, liturgical, pastoral and cultural questions, and offers practical suggestions and insights that will be helpful to those involved in taking funerals and caring for the bereaved and the dying. What are the purposes of a funeral? People often speak of funerals being for the living, but what about the dead? What is their role at the funeral? Why does contemporary society deny death and how do we help people face the reality of their mortality? How do we minister in a pluralistic culture where people are ‘spiritual’ but not ‘religious’? What is the difference between a Church funeral and a celebrant-led service? How do we respond to the ever-increasing preference for cremation and the challenges this form of disposal presents? How is grief expressed on the Internet and in what ways is the ‘Green Movement’ influencing the New Zealand way of death? How do we pray for and remember the dead? What is the Christian understanding of life after death and what place is there for doubt? How did funeral services develop? Since the 1970s, the funeral scene has undergone sweeping changes. Innovative funeral practices developed in New Zealand have been studied by and adopted in other countries. Life-centred funerals, led by celebrants, have become the norm and cremation is now much more common than burial. 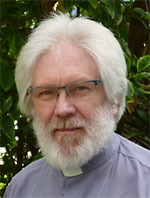 When the Anglican Church in Aotearoa New Zealand revised all its liturgies, it produced the most comprehensive funeral rites in the Anglican Communion. They enable its ministers to respond creatively to the needs of the bereaved in a contemporary setting. The current New Zealand Anglican Liturgies are flexible and for the most part sound. Alister Hendery highlights places in which they can be enhanced and offers positive suggestions for improvement. An overarching theme of Earthed In Hope is that while celebrant-led funerals provide a valuable service to the community, the Church is still well-positioned to work with the bereaved, conduct funerals and perform the various rituals associated with death. However, it must do things in a new way. Hendery urges the Church and its ministers to give more attention and priority to this vital aspect of Christian mission. Hendery challenges the ‘stage-model’ of grief, which was put forward by Elizabeth Kübler-Ross, Granger Westberg and others, offering examples of other ways of supporting and guiding the bereaved. The words used at a funeral are very important, but rituals and actions can be even more important as they express the inexpressible. We need ritual when what we experience is too profound and significant for ordinary expression and routine words. The funeral minister’s role is complex and demanding. It’s not just about reading words from a book or being a MC. Most importantly, it’s about being with the bereaved. Hendery argues that our contemporaries are looking for people who will hear their questions, respect their searchings, and journey with them as a friend in their pain and confusion. He notes that as the medical profession has taken over care for the dying, so care of the dead has passed to the funeral industry. However, he believes the bereaved need to be encouraged and supported in taking a more hands on role in the care of their dead. This can be done in small but significant ways that help bring home the finality of death. Hendery deals sensitively and in detail with the issues surrounding funerals for children and those who have suicided. Alister Hendery is an Anglican priest who has served in a wide variety of parish and diocesan settings. He has also worked in private practice as a counsellor, specialising in grief and loss, and as a funeral celebrant. Currently he is an interim priest, ministering with parishes in times of transition. Funeral ministry has been a focus of his life for 35 years. He has an ongoing interest in death studies and continues to journey with people experiencing loss and change in all spheres of life, as well offering mentoring and training to lay and ordained ministers. 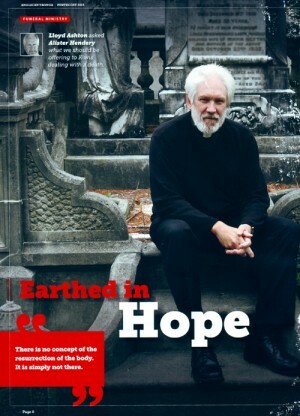 In addition to his extensive pastoral experience he has read widely on this topic and Earthed in Hope includes many insights from other writers both in New Zealand and overseas. Hendery is well placed to advise on the care of the dying, the bereaved and the dead. 4 — What Comes Next? 5 — How Might We Respond?